More than a month’s worth of rain in one hour. The onslaught came suddenly on Monday afternoon, with an estimated 102mm (4 inches) of rain bucketing down on the village of Ogndal in a single hour, followed by heavy hail which left a layer of ice across the area. The area, about 80 miles north of Trondheim, has no monitoring stations, but the downpour almost certainly qualified as a Norwegian record, said Fagerli, who estimates that the country’s unofficial record is probably somewhere between 80-90mm per hour. Maybe the video is right, says John at Bayshore (referring to the video about a 60% Reduction in Solar Activity Means a 5C Drop by 2030). Big snow dumps and ice have closed roads in several parts of NSW, including the Blue Mountains. Both the Great Western Highway and Bells Line of Road have been closed, leaving no way for motorists to travel between Sydney and Lithgow. Authorities have advised motorists in the south and west of NSW to delay all non-essential travel, with the Hume Highway closed at Berrima, while the New England Highway in the northeast is closed between Glenn Innes and Armidale. Major roads have been shut down across NSW this morning as heavy snow blanketed parts of the state. The white flakes fell thick and fast in the Blue Mountains west of Sydney from about 10pm overnight. The snow was so heavy vehicles were stranded on the Great Western Highway near Katoomba. Snow has also fallen thickly around Goulburn south of Sydney, Orange and Bathurst in the Central West, and as far north as Armidale in New England. The Great Western Highway and New England Highway remain closed in parts, along with the Mitchell Highway between Orange and Bathurst. 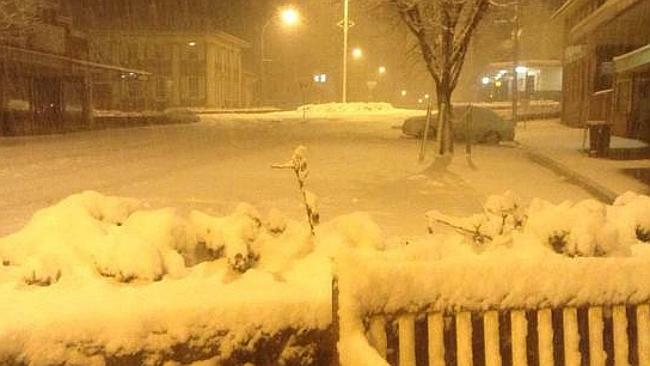 Meanwhile, residents in Queensland’s south will also be waking up to snowfall this morning. Snow has fallen on Stanthorpe near the NSW border, with locals getting out to make the most of the wintry conditions. More snow is forecast to fall as low as just 600m above sea level today. I thought all the windmills and solar were suppose to stop it. Interestingly, it was mentioned on the BBC news this morning, that the British government are cutting back funding on wind farms and solar panels. Now I wonder why……..
A SNOWSTORM has shutdown highways and left people stranded in their cars outside of Sydney this morning. Over 10cm of snow has been dumped on Katoomba and has been felt as far north as Armidale and south as Goulburn as NSW’s cold snap intensifies to its most frigid conditions yet. State Emergency Service spokeswoman Jenni North said they had worked with police and the Rural Fire Service to set up refuge stations to taken stranded drivers in the Blue Mountains. “We’ve had about 30 requests overnight a large part of those involving assisting stranded motorists due to the snowfall across widespread areas,” Ms North said. “We’ve set up a couple of refuge stations to take the stranded motorists to those areas because they’re unable to travel in the cold conditions. Nothing like a summer’s frost to invigorate the system. Frost advisories for the Campbellton and eastern half of Restigouche County, western half of Restigouche County, Edmundston and Madawaska County, Grand Falls and Victoria County and Mount Carleton – Renous Highway regions. “Frost may damage some crops in frost-prone areas. Patchy frost is expected tonight in low lying areas as the combination of a cool airmass, clear skies and light winds will allow temperatures to drop close to zero. The frost will dissipate early Friday morning after sunrise. Cover up plants, especially those in frost-prone areas. In comments from John Casey, author of Dark Winter, the next aspect to look for was more moisture. He believed from his studies this would be a sign within scientific reason that should come and possibly be the ignition of the next heavier snows and perhaps the trigger of the abrupt transition in to the expected cold spell. He also commented that the wild card in the ice age story was that of a significant volcanic eruption adding debris in the stratosphere. If the volcanoes participate then our experience will become even more harsh and much sooner. Trade winds/fronts creating a constant temporary pattern of heat, cold or rain is a normal occurrence and does not prove global warming or cooling. Basically, nature gets stuck in one place and you get coninuous heat, rain, etc. for a period of time. That does not make it any easier to live through. That’s very true, Mauri, but just because we’re in, or entering, a Little Ice Age does not mean that every place on Earth will suddenly turn cold, and that there will be no more hot days in warmer countries. The change will be quite gradual, especially closer to the equator. Imagine if all this precipitation was in the form of snow. expecting reports of flash floods. Imagine if all that rain was snow. Today Norway experienced temeratures below 0 C several places. This one is probably hard to translate in google, since its written in “nynorsk”, a common sidelanguage here. Short summary: They interview a meterologist, saing that during the night it was -3.7C in Hovden and around 0C some other places. Temeratures have been unusually low for the time of year. Coldest in 10-15 years, he says. This same phenomenon is occurring this month of july in Brazil. Floods in the south region are devastating crops. The authorities are not paying attention to this problem because the country is being presently razed by corruption – once more – and there is no space left for the discussion of other themes.